Friday night: Windy and cold. Single digits and teens. Winds ease late. Saturday: Bright start, few PM clouds. Still chilly. Highs in the mid/upper 20s. Sunday: Developing showers. Milder. Steady south wind. Highs in the 40s. After an icy start off the well-treated interstates, cold and dry air has taken over, sending temperatures down into the 20s and wind chill values to the single digits and teens on a gusty northwest wind to 40 mph in strongest gusts. 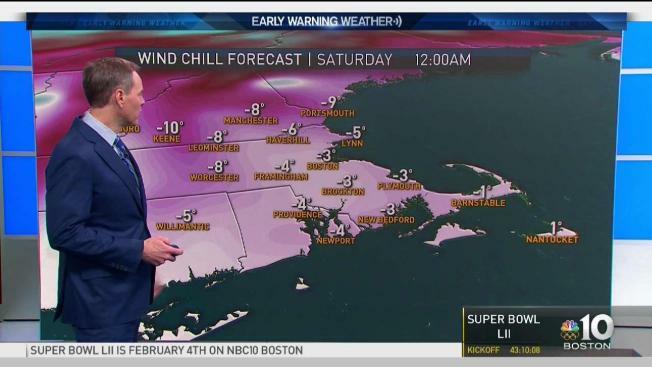 Expect a fresh overnight breeze to couple with low temperatures in the single digits and teens to create subzero wind chills. The cold and dry air will make Saturday exactly that — cold and dry — though the cold won’t be exceptional, and highs in the 20s and teens in the mountains will be just great for winter sports across New England. The next storm system to approach New England stays mostly to our west, meaning warmth has an opportunity to stream in ahead of it... which is why most of southern New England will see rain showers developing Sunday late morning onward. However, for those in northern Massachusetts points north, enough cold air should linger for precipitation to start as snow showers before changing to raindrops, and in northern New England, accumulating snow is probable Sunday and Sunday night, with the rain and snow departing early Monday. After a short break in the action, another storm will wind up just west of or over New England Tuesday night through Wednesday, likely delivering another round of rain showers south and snow north, and leaving a shot of cooler air in its wake for the end of next week in the exclusive, Early Warning Weather 10-day forecast.